"Her novels are like Agatha Christie's whodunits, but they have a hard, contemporary edge that enhances the fear factor. They are so addictive, in fact, that her readers would surely suffer withdrawal symptoms unless they kept coming on a regular basis…She is one of the most talented story tellers around." HANK: You don't hear me gush much. I introduce people, I'm laid back, I'm oh-so-casual. But I have to say. I would not be where I am in the world of mystery without Mary Jane Clark. Couple of reasons. One, her books are genuinely wonderful. Before I even consciously thought that I might be able to write mysteries--I devoured her books. Yes, they're about TV. Yes, I was completely carried away. Yes, I was--okay, I'll say it. Hugely jealous. And a huge fan. But it was more than the TV part that made her New York Times bestsellers such a must-read for mystery fans. She really knows how to tell a story. A riveting, original, page-turning, compelling story. Here's a great sound bite from her. And when she read PRIME TIME and agreed to give me a blurb--well, lets just say she doesn't know it, but I would have changed the shelf-paper in her kitchen. Still would. So I am so happy to be able to welcome her to Jungle Red today. And so delighted that she's on the verge of new wild success with a brand new series. Yes, I'm gushing. what can I say. When I was a little girl, my mother bought a set of piping tips and a Wilton cake decorating book. Oh, how I loved looking through the glossy pages of that catalogue! I can still remember the circus cake, the monkey cake and the princess cake with the edible skirt and Barbie doll lookalike upper body. After she got the hang of making and decorating the cakes for my sister and me, my mother let our playmates go through the book and pick out their favorites which she would then make just for them. It was a big deal to all of us. Everyone looked forward to her turn with excitement. Today, that’s one of my favorite childhood memories. I had absolutely no idea that I would end up writing about a cake maker who gets involved in mystery and suspense. It’s funny how life works out, isn’t it? HANK: Well, it is. As I said, after an amazingly successful series, which is still one of the most beloved and iconic ever, Mary Jane Clark is adding another series to her resume. So, Mary Jane. Tell all! MARY JANE: To Have and to Kill is the first book in the Wedding Cake Mystery series. Actually, the idea came as I was watching a segment on morning television about decorating wedding cakes. There were multiple gorgeous cakes made for an array of wonderful destination weddings. I started to think, what if a wedding cake maker got involved in a murder case which threatened to prevent the wedding? Then, I realized it could be a series…each time involving, a different bride and groom, different family and friends, in a different location while the cake maker, Piper Donovan, figures out who is doing the killing. Piper is a struggling actress with no immediate prospects and a recently broken engagement. Reluctantly, she moves back in with her parents to take stock of her life. Piper steps tentatively into the family bakery business, and finds herself agreeing to create the wedding cake for the acclaimed star of a daytime television drama. But soon deadly things start happening around the bride-to-be and it seems that somebody is ruthlessly determined to stop the wedding. I know. Cake decorating is a world away from television news, the backdrop for my twelve previous books, but, the writing style is still the same, with the aim to create chilling suspense. As always, I’ve tried to come up with clever plotting, a driving narrative and lots of surprises. With mystery, romance and family relationships, I hope To Have and to Kill has something for every reader. Of course, they say you should “ write what you know”. So, I have been taking Wilton cake decorating classes myself. It’s been so much fun, but the professionals don’t have to worry. It will be quite a while before I give them any competition. Mary Jane Clark's media thrillers have appeared on the New York Times, USA Today, Publishers Weekly and other national bestseller lists. Her books have been published in 23 languages. Mary Jane spent three decades at CBS News' New York City headquarters... where she began her career as a desk assistant after graduating with degrees in journalism and political science from the University of Rhode Island.... and worked her way through the ranks to become a producer and writer. Her first books came from that experience. She developed KEY News, a fictional television new world where the characters go out into the world to cover their stories and get involved in mystery and suspense. Those twelve novels, include Do You Want to Know a Secret? Do You Promise Not to Tell? Let Me Whisper in Your Ear, Close to You, Nobody Knows, Nowhere to Run, Hide Yourself Away, Dancing in the Dark, Lights Out Tonight, When Day Breaks, It Only Takes a Moment and Dying for Mercy. To Have and to Kill is the first book in The Wedding Cake Mystery series. Mary Jane is the mother of two grown children and has homes in New Jersey and Florida. And in honor of Mary Jane's new series, Jungle Red will provide a signed copy to one lucky random commenter! Wonderful interview--thank you Mary Jane and Hank! I love love love the story of your mother decorating cakes for all your friends. I'm sure I would have picked the Barbie cake:). The new series sounds like so much fun. When I first got married back in the late seventies, it was a very homemade affair. So my sister and I made the wedding cake. The icing contained sugar and pounds and pounds of CRISCO! Ick! Maybe we stuck a few flowers on it, but the decor was nothing remotely similar to your pics. Looking forward to the series--it's bound to be a hit with great stories, baking and weddings! Oh, the wedding cake Jonathan and I had--was a croquembouche! A tier of cream puffs. It was gorgeous, and delicious. But freezing acouple to have on our anniversary--not so successful. Thanks for visiting. MJ was the guest of honor at Murder 203 last April and she was wonderful. So inspirational and so accessible. I barely remember my wedding. My husband's assistant at the time did everything, I just showed up in the dress. Every once in a while i get into serious cookie decorating but have yet to attempt an elaborate cake. Will Piper (great name! )be giving tips and recipes? 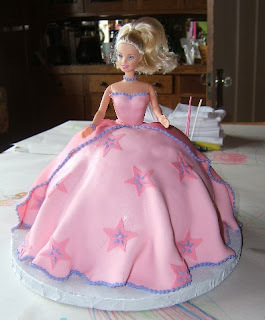 That's a beautiful Barbie cake. My wedding cake was pretty simple. I wanted to spend the money on the photographer. I do have a funny story regarding my wedding cake. I ordered it, but someone had to pick it up. Since most of us were busy doing other wedding things, my husband got an aquaintence of ours to pick up the cake. First,we didn't realize we were suppose to bring a wedding topper, so the poor single guy had to choose for us, then his darling kids clung to the cake boxes for dear life while our friend drove his convertible to the reception. I heard the groom's cake was delicious, but it was gone before my husband and I could have some. Oh that reminds me, Mary Jane. Have you checked out the website CakeWrecks? May find some great material there. The life size bride's cake could prove inspirational. What a fun interview, and WONDERFUL idea for a series, Mary Jane. I'm so impressed that you've been taking Wilton classes. I would never dare. Cakes? Wedding cake #1 was pretty standard, with white icing roses and the classic plastic bride & groom. #2 was white & ginormous w/ real jewel-toned flowers to match the bouquets. It had a yummy layer of raspberry running through it. #3 was quite small, covered in sugar pearls and fondant--elegant, but the worst fondant ever. Very chewy and definitely not worth saving. So, five years ago, when hubs and I renewed our vows, we ordered a big sheet cake from WalMart. It was delicious! In um, another wedding, haprrumph, I left the cake to the caterers..I just said: white, tall, fresh flowers as decoration. I went into the kitchen of the wedding venue (it was a historic mansion) day-of--and they had decorated the cake with CARNATIONS!! Argh argh argh. I yanked them all off the cake, (not angrily, just politely but firmly) and asked for peonies. Sheesh. As it turned out :-) it didn't matter... Although I still love peonies. Your new series sounds, um, delicious, Mary Jane! My mother also created very professional-looking cakes for my three siblings and me. She even made roses. I did my best to do creative cakes for my own children for their birthdays, although I did not take a course (and it showed, of course). I made a bug cake, a fire engine, an apartment building (huh? ), a baseball, and so on. Can't tell I have sons, can you? It was fun and pleased them. The one wedding cake? I know we decorated it with beach roses and violets, but since the marriage didn't last, the memory hasn't quite, either. Love the interview and the cakes! OMG! Would love Mary Jane to guest blog on DyingforChocolate.com... and write an article for the next issue of Mystery Readers Journal: Hobbies and Special Interests. perfect fit. but all that aside. My last wedding cake..don't ask!.. had a dagger with red raspberry blood dripping over the white fondant. That wasn't quite enough, so I added fresh white roses around the dagger-- and on the side small statues of Dudley Doo-Right and Betty Boop. Oh, Janet, that wedding sounds like an entire blog! It's hilarious. Are there photos anywhere? Laura--you and me, sister. So funny! I do remember the cake had fresh roses from the garden on it. Oh, and we also had a page-dog. My flat-mate's beautiful collie wore a white bow and carried the rings in her mouth. AND--both working for a major broadcasting corporation and nobody thought to take videos! Mary Jane, so glad you're here! The new series sounds great. Congrats! Cake decorating has always fascinated me. Don't you think you have to be in a Zen kind of place to do it? Tiny little perfect increments... I so admire anyone with a steady hand and the patience. My wedding cake...I actually do not remember my wedding cake. What can I say, it was 1969. I've always baked chocolate birthday cakes for my kids; early on I decorated them and then they asked to take over (it's fun and they're better at it). The main decoration: nonpareils. Nonpareils Can you eat those? Remember the little silver ones? What are they, anyway? My mother used to make a lamb cake, with a HUGE castiron mold, and then cover the molded lamb with coconut. I remember it being a big deal! But maybe that was because I was such a little girl. Wedding cake #2 was simple with lemon filling and I never got a single bite of it beyond the bit my husband fed me for the obligatory photos! Ah, Peg. Moms. can't live with 'em, can't live wihtout 'em. Terrific interview and I can imagine all sorts of intrigue for the cake decorator. I have a good friend in party planning in New York City and there are any number of brides and mother of the brides she'd love to murder. Hey Hank, the frozen one year cake isn't supposed to taste good - everyone knows that. You have a bite and throw it away! And you know when I read your later comment about the lamb cake, I actually thought you meant LAMB, as in a meat pie. My cooking brain went wild, I was thinking, with coconut?? Really? NO, lamb like baby fuzzy lamb. With cake inside. Although lamb and coconut, like a curry..thogh could work.. Wait, throw the one year cake away? You SURE? I still have ours, from 1997. I bet I couldn't get myself to throw it away. Problem. Dragees...the little silver balls. i actually own 500 cookie cutters and everything you could possibly want to put on one. Okay..the verification word is pertee..as in a comment on the cookies? Oho...for this second time around wedding between two lawyers, we had a giant sheet cake with chocolate icing and big yellow sunflowers that quoted Arlo Guthrie, from The Alice's Restaurant Massacree..."A Typical Case of American Blind Justice." My wedding cake was quite plain. It was provided by Sandals Resort where we were married. Loved the interview, Mary & Hank. In response to my wedding cake, it is a wonderful memory for me. My husband & I married with $500 in the bank. Little did we know then that 5 days after the wedding he would be fighting for his life and remain in hospital for 6 weeks! This would continue for another 15 years. Because we had no money (and soon my husband would have no job, but we didn't know that yet), we held the wedding at my Grandparent's house. 88 people were in attendance, all related except 4. The minister performed the service free. But back to the cake. Grandma, Mom, my Aunt and me all made the fruit cake, taking turns mixing it. A neighbour of Grandma's did the decorating, plain by today's standards, but it looked great to me, and had plastic doves which I still have. We were married on the Ides of March (we should have known better), but next March we will celebrate 48 years of marriage, so we must have done something right! My mom also decorated cakes - she took the beginners and the advanced Wilton Cake Decorating classes and decorated MANY cakes. She rarely does it now and would probably cuss at the rose "tee" if she had to do another rose. :) I have never been married, so I haven't had a wedding cake, yet. But I would love for it to be many tiers and of different flavors, but totally traditional in decorating. Kate! You and Ken are too adorable. Betty, that is the sweetest story ever.Ever. You made the day. Please give a hug to your dear husband and many more years of happiness and love..
Kelli JO--tiers of different flavors--what a cool idea! Bakers--would that work? Is, like, a chocolate layer heavier than a white layer, or anything like that? MMMMmmmm. Sandals! Who needs a cake when you have a beach! I love these stories. Betty, hope your husband is completely recovered. Ro, 500 cookie cutters? Good lord woman, what could they all be in the shape of?? And Kate, that's perfect! Isn't it funny that we charge ahead into another marriage and maybe even another--and sometimes they really work out! At my daughter's wedding we had cupcakes... and we did cupcake tastings at a number of local bakeries to find the best. It was hard work but someone had to do it. She painted cake toppers for one of the cupcakes that she and her hubbie shared. Hungry, hungr..all this talk about lemon cake and cupcakes..
My wedding cake was a 3 tiered Italian Rum Cake with Raspberry filling. We came back from the Honeymoon and not having anyone to tell us about tradition, perked a pot of coffee and sat down and enjoyed the top of the cake. No worries, we have been married over 35yrs now. Your new series sounds delightful. I will go and add it to my list. Great interview and sounds like a lovely series, Mary Jane. My wedding cake was a three=tiered affair. It was loved and delicious. However, the top layer was the anniversarly cake. We stored it in my mother-in-laws freezer to enjoy. Well, Hank, like you we didn't have much luck with it. It was fallen apart when defroasted. We tried to put it back together to cut it and it fell apart again. Guess what we found? A huge rather dead moth! All we could think of was, "Did anyone get a moth in their cake at the wedding and never told us. So no anniversary cake for us. We had a small two tier cake, white with dark red roses. I still have the cake topper with icing red roses piped in and the bride/groom figurine, both sitting on the top shelf of a small curio cabinet (and we got married in 1982)! We had a small wedding with just immediate family, and the reception at a quaint restaurant called The Little Brown Jug. Oh, Jeannie--your story and Pat's together are the clear indication to eat the top instantly!! Right? OH, that comment was from me--forgot to switch accounts! AND WE HAVE TWO WINNERS: (drawn by my dear husband): Nightreader and Kuzlin! PLease contact me via http://www.HankPhillippiRyan.com to get your prizes! And! Thursday--marketing secrets--and marketing answers revealed! Anyone who's got a book out, or in the works--you don't want to miss it. Plus--even more on marketing on Friday--from another real pro. The top then things you need to know...to make it big. I love reading these comments...and enjoy the fact that so many described their own wedding cakes. I'm hoping that the new series will appeal to everyone who has had a wedding, planned a wedding or even wants to forget a wedding! Janet...Thanks for the offer. Contact me at mjc@maryjaneclark.com. Thanks for being here, Mary Jane! Winners, don't forget to contact me!